Roxtons Varzuga Blog: Blog out! We had a Blog Out! - apologies - the main Google Blog site crashed for some reason on Friday, yesterday I went to Murmansk and now, Sunday, have finally settled down, our first guests are out fishing and I have a chance to catch up. Friday was pretty busy putting the finishing touches to Lower Camp; the ‘lawn’ in front of the new accommodation is, frankly, a mess, but that is what happens after a major construction project. We have done our best to level it and we hope the grass seed will take soon when the weather warms up, if the lemmings have not eaten all the seeds by then. Jessie took our the new guide at Lower, Sergei, down to Bear Corner for more instruction and familiarization. 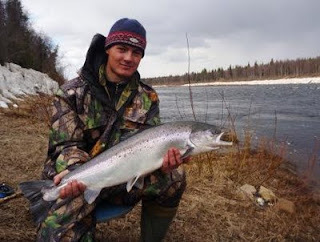 On his third cast Sergei landed a fresh 11lber! 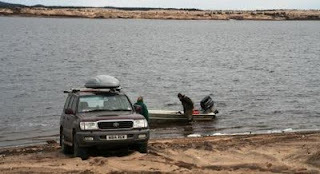 Tiffy, Anna and I drove a spare outboard engine to Kuzamen in Tommy the Toyota – his first experience on sand dunes – sand dunes with deep snow on them are bizarre, and quite tricky driving too; pleased I put a decent set of new off road tyres on before leaving UK. 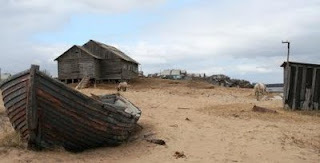 Kuzamen is as remote as it gets, there are 30 residents living in nowhere amongst the sand dunes at the mouth of the Varzuga. The White Sea light and air is always extraordinary – it seems to the visitor (and there are very few) to be on the edge of the world, I guess it nearly is. We met Ura on the White Sea beach and boated up to Kitza camp to be met by Sergei, Victor and Luba. The camp looks great, lots of new paint, all the boats and engines up and running and some salmon are already up to Heli Pool and beyond. Wonderful to be back at Kitza and to meet our friends there – a very special place looked after by even more special people. 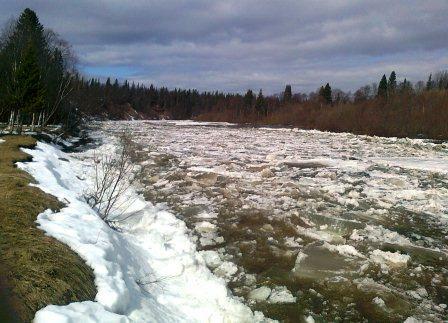 Luda gave me this shot of the Kitza river ice breaking up on 28 April. If you have never seen this, believe me, it is noisy, awesome and frightening. Yesterday we flew to Murmansk to collect our first guests and they were all putting up rods by 6 p.m. I have not heard the Middle Camp first result yet, but here at Lower, Craig P landed 7 salmon after dinner last night and had 3 more before breakfast – not a bad start. A bright blue sky today but chilly after an overnight frost of -5⁰C. Water temperature remains at 3⁰C. I’ll have much more on the fishing front tomorrow when we hear how everyone has got on today.